With an increasing number of working parents, two out of every three U.S. children under 6 years old now require child care by someone besides their parents. Children, especially infants or children in their first year of child care, are sick with colds and other airway infections, pink-eye, and diarrhea more often than children who stay at home exclusively. Many child care settings have policies that exclude sick children until they have a doctor’s note, are taking antibiotics, or their illness has improved or resolved. When children are excluded from child care due to illness, working parents face a new challenge: how to take care of their children and still meet their work obligations in order to get paid and support their families. In May 2012, the C.S. Mott Children’s Hospital National Poll on Children’s Health asked parents with children less than 6 years old in child care about their opinions on the impact of child care illness on their families. Among parents with children in child care, 62% report that their child could not attend child care at least once in the past year because of illness, and 38% say their child was unable to attend child care three or more times during the year because of illness. Nearly one-quarter (23%) of parents said their children had been sent home from child care at least once in the past year due to illness. Missing work because a sick child was sent home or not allowed into child care is common; 42% of parents of young children in child care have missed work in the last year. Nearly a quarter of parents (26%) missed work three or more times over a one-year period because of their child. When a child is sick, parents must either take time off from work, make other child care arrangements, or try to get immediate medical care in order to comply with exclusion policies for the child care setting. One-half of parents with children in child care report that finding alternative or back-up child care for their sick children is difficult (Figure 1). In addition, about one-third of parents say taking time off of work with a sick child is difficult because they may lose pay or lose their job, and a similar proportion report that they do not receive enough paid time off from work to care for their sick children (Figure 1). When asked about where to take a sick child for care, 8% of parents with children in child care say taking their sick child to the emergency room is more convenient than seeing a primary care doctor. Nearly two-thirds of parents of young children in child care say their children could not attend because of illness in the past year. 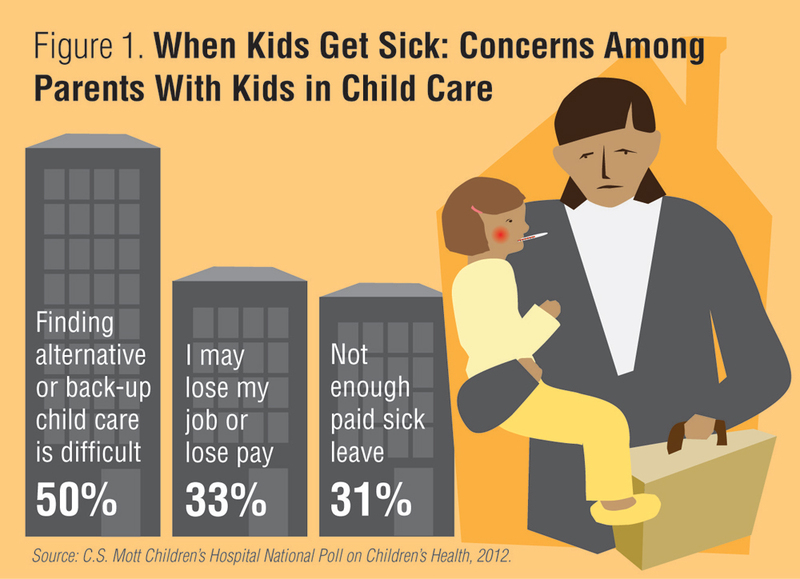 One-third of parents of young children are concerned about losing jobs or losing pay when taking off work to care for their sick children. 8% of parents with kids in child care say taking their sick child to the emergency room is more convenient than seeing a primary care doctor. Many families require child care services for their young children, and this Poll finds that setting up care for sick children remains difficult for many parents, for several reasons. According to the American Academy of Pediatrics, not every well-appearing child with a runny nose or cold needs to be sent home from child care. Typically, colds are spread before the child has any symptoms, so exclusion from child care does not necessarily reduce the spread of illness. Training child care workers to make safe and appropriate exclusion decisions based on national American Academy of Pediatrics and American Public Health Association guidelines (Caring for Our Children: National Health and Safety Performance Standards; Guidelines for Early Care and Education Programs, 3rd edition) may reduce the burden of child care illness on families. As many as one-third of parents with kids in child care worry about losing wages or their jobs because of missing work to take care of their sick children, and one-third also say that they do not receive enough paid sick leave. According to the National Partnership for Women and Families, an estimated 40 million workers in the United States (40% of private-sector workers overall, and 80% of low-wage workers) lack paid sick leave benefits. Improving employee benefits related to paid sick leave appears to be important for many parents because it would allow parents to care for their sick child at home or give parents the opportunity to go to their child’s usual health care provider instead of the emergency room. This report presents findings from a nationally representative household survey conducted exclusively by GfK Custom Research, LLC (GfK), for C.S. Mott Children’s Hospital via a method used in many published studies. The survey was administered in May 2012 to a randomly selected, stratified group of parents with a child age 0-5 in child care (n=310) from GfK’s web-enabled KnowledgePanel® that closely resembles the U.S. population. The sample was subsequently weighted to reflect population figures from the Census Bureau. The survey completion rate was 55% among panel members contacted to participate. The margin of error is ± 5 to 8 percentage points. Davis MM, Hashikawa A, Singer DC, Butchart AT, Kauffman AD, Clark SJ. Sick kids, struggling parents. C.S. Mott Children's Hospital National Poll on Children's Health, University of Michigan. Vol 16, Issue 5, October 2012. Available at: http://mottpoll.org/reports-surveys/sick-kids-struggling-parents.